Sleep Tight is a cartoony twin-stick shooter . Bed Bugs biting? Bite Back. Things that go bump in the night have always been a fascinating idea for stories. As a kid, when something goes bang, your mind leaps to all the things you think it could be, and that imagination gives you some unpleasant answers. Sleep Tight‘s trailer has a good point: if monsters aren’t real, why does every kid imagine them? 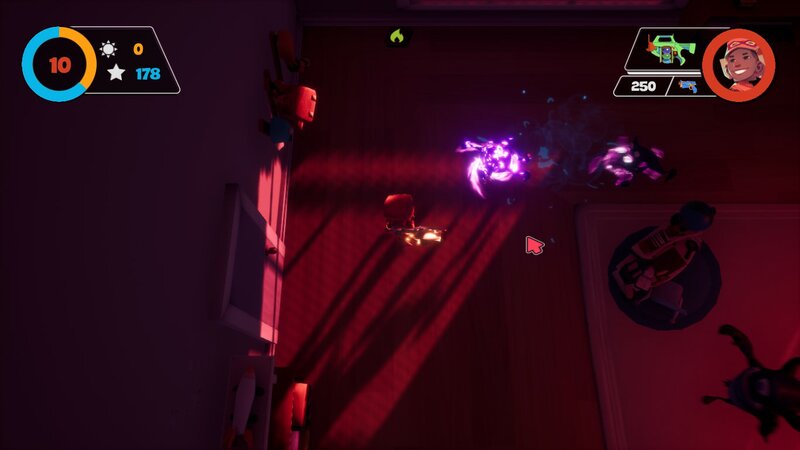 Philosophical questions aside, Sleep Tight uses that as an excuse for its gameplay: a horde of monsters is creeping into kid’s rooms nightly to beat them up, or maybe eat them. Whatever they want, they could have picked some better targets though, as these kids are packing. The player takes control of the cast, all with some personality gimmick to them that could have come out of a Saturday Morning cartoon. Sleep Tight is a twin-stick arena shooter, and, as you’d hope from that genre, the game gets right to the action with no downtime. 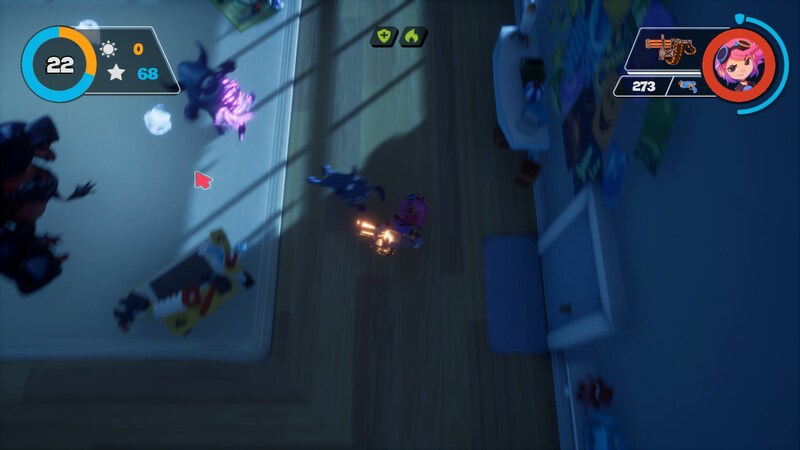 Monsters will gradually warp into your room every night, and you’ll have to fend them off with your guns and equipment as things constantly ramp up. Each monster you gun down drops stars, and every day you also gain stars; which can be used for upgrading your weapons, buying perks, and installing walls and turrets to take some pressure off yourself. You have total freedom for what you want to focus on. 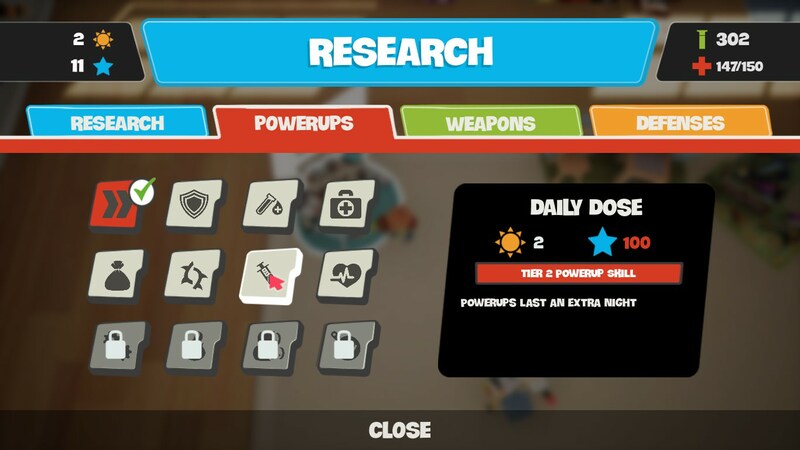 You could go for boosting up your character by buying power-ups and increasing how much damage their gun does, or try to make a big fort of walls and turrets that take down enemies without you needing to fire a single shot. Each of these approaches has their weaknesses, of course: if you’re doing things solo, you’ll need to devote a certain amount of currency to buying ammo, which you do not want to run out of during the night. If you’re putting down turrets you’ll need to protect and repair them, since if one gets blown up, it means you lose everything you put into it. You also unlock other characters by accomplishing certain objectives as you play, like finishing a bunch of nights without firing a shot yourself, or having every power-up on your character at the same time. Most of them are just unlocked through normal play, however, by reaching a certain threshold of nights completed in one playthrough, or by killing a certain amount of monsters overall. This means that when you’re starting off the game, you’ll be putting a lot of time into the early ones, who are pretty plain: not counting the tutorial character, the first two are only unique from an extra weapon they start off with, and if you don’t care for that weapon, or if you buy another one, that means they’re now worse than other characters. In general, it feels like there aren’t as many upgrades to buy as there could be. The game keeps track of your playstyle, but there aren’t that many: you’re either building up yourself, or you’re building up the room’s defenses. Cutting down things even further are perks, which make you feel like you can’t do without optimally, like two that increase the number of suns you get, and a couple that increases how many stars you can get. So it feels like a game it won’t take too long to see everything in, but one that expects you to play a fair amount to unlock the characters, making for kind of a paradox. I feel like at a certain point you’ll end up having a ton of currency but nothing new to spend it on, too, which can be a drag. What’s in the game is certainly fun, though. The characters control well, the guns feel snappy, and things move fast, making for a good gameplay loop. Some things about it can be finicky, though. For one, the game switches from day to night right as you spend your last sun, as in as soon as you back out of a menu with zero suns it switches over instantly. It feels a bit harsh, and even if you have enough stars to convert into suns, it doesn’t let you go back. 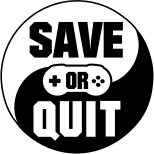 So if you needed to buy ammo and you forgot about it for a second, that’s too bad, and if you’re at a state where you have to run away from monsters you’re probably dead unless you have a ton of power-ups. It feels like making that available when you have zero suns, but not forcing you until you’re definitely ready would be a better way of doing it. The game has voice-acting from the kids you control that’s all based around their gimmick. It’s not bad exactly, but it’s clearly adults trying to sound like children, and if you play long enough you’re sure to hear all the lines for every character, multiple times. Thankfully you can turn them off if they aren’t your thing. Overall, while Sleep Tight isn’t a bad game by any means, and has some fun action, it has some annoying things about it, and I question whether it can keep people attracted as long as it intends. As I said though the gameplay is good, good enough to rank it a SAVE.